Hey everyone! I have a bunch of updates for some really cool new projects I’ve been working on awesome people with. First up – Have Spellbook, Will Travel. You may have heard Rudy Basso and I discuss our new podcast on the most recent episode of the Round Table. You can listen to the first episode TODAY. It just dropped. What is Have Spellbook, Will Travel? It is a fantasy comedy drama radio play podcast that’s the brainchild of Rudy Basso. The podcast is loosely based on events and moments that happened in our own Dungeons and Dragons games. The podcast is funny, clever, and features some great characters we hope you’ll fall in love with the way we have. This thing is a real labor of love that we made with our amazing actor friends who also love games. If you listen to the Round Table you’ll recognize panelists Ray Fallon, John Fischer, Andrew Timmes, Alex Basso, and Vegas Lancaster as part of our awesome crew. I’m part of the cast myself. I play Old Man Wisely, the story’s narrator. Rudy is the creator, writer, editor, producer, and one of the main actors on the show. I helped Rudy write and produce the first few episodes, but he’s done the lion’s share of the work. I promise his efforts are more than worth your time. I friggin’ love this podcast. I am going to be a featured guest at Roll20CON. What is Roll20CON? It’s a free, online-only celebration of the Roll20 Community will take place on June 3rd, 2016 for just 24 hours – but you can start preparing, listing, and joining games now! From 12AM – 11:59PM Pacific time, there will be games galore played on my favorite virtual table. You’ll want to join in the action and get to try some of the Plus and Pro subscription features for free. That’s right. Dynamic Lighting (and tons of other awesome features) will be free during Roll20CON. During the convention, some of your favorite streamers, publishers, podcasters, and I will be live on Twitch helping raise money for Cybersmile, the international non-profit supporting victims of cyberbullying. Check out the schedule below! 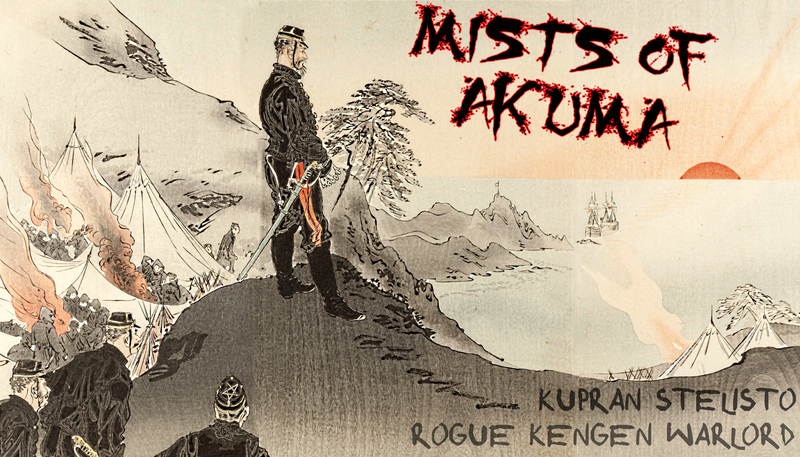 Finally, if you listened to the most recent Round Table than you know I am VERY excited for Mike Myler‘s Mists of Akuma. This Kickstarter for a fifth edition D&D Eastern Fantasy Noir Steampunk setting is rich and wonderful. Check out the video below to get the scoop on Akuma! I can’t wait to play in the world. Plus if this project is overfunded, I’m designing one of the stretch goals (can’t say exactly what yet… just gonna have to fork over those dollars to find out). Mike was kind enough to let me host a little preview of Mists of Akuma‘s prefectures here on World Builder Blog. Take a look at his awesome words below! The capital of the Imperial Prefecture, Sanbaoshi, a metropolis that tentatively embraces technology but is still steeped in the traditions of Soburin’s past. Chikan, Star of the North, where science is a part of everyday life and the Mists of Akuma are kept at bay with turbines, fans, and other machines that create powerful blasts of air. Nagabuki, Gem of the South, is within the martial prefecture of Ikari and home to the monastic order of tattooed monks, utilizing magic to treat those afflicted by the fell fogs. Traditions kept alive since the millennia long Ichizoku Wars caused different magical and martial disciplines to develop as much as the drafting enforced by foreign invaders during the historically more recent Kengen Occupation, informing the nature of each clan’s bengoshi and henchmen as well as their culture. The Masuto rose to power at the end of the Ichizoku Wars, leveraging something against the Imperial Dragons that allowed their upstart forces—mostly paid ronin and spellswords—to finally overcome the armies of the 22 warring clans. Once she had assumed authority, Sohei Masuto cemented her family’s place in Soburin by claiming the center of the continent as their own, governing from the heart of the landmass and creating a bulwark safe from the greatest clan rivalries. The tactic worked and from the capital of Sanbaoshi a Masuto has ruled as Emperor for an almost 1500 unbroken years. Ceramia invaders recognized the great value of the Imperial Capital immediately, targeting it in the Battle of Gyakusatsu and breaking the will of Soburin in a violent display of superior warfare that cowed the continent. Using it as their beachhead, advanced science became more and more common in Sanbaoshi as the Kengen Occupation wore on for over a century. Today, 50 years since the fall of the Kengen (the last remnants of Ceramian and Ropaeo forces still alive after the War of Kaiyo’s apocalyptic end on the other side of the Great Divide), many of their technologies are banned. The most violent or invasive machinery is forbidden, as are some even innocuous items, but others remain: electric lanterns are everywhere, tinkerers’ shops can be found all throughout the metropolis, and samurai fitted with steel augmetics walk the city’s streets. As the central seat of government Sanbaoshi is a place of great intrigue among the bengoshi of the clans. Each of these functionaries is constantly at work for their lords, working to undermine their rivals and raise their patron’s esteem as well as their own. The Imperial Guard is constantly chasing down suspicious persons and the Imperial Capital has countless potential agents to spare—adventurers are common here, easy to manipulate, and cost only a few Imperial Pieces (so any bengoshi worth their salt is never in short supply of either). Emperor Hitoshi Masuto’s tolerance for technology, the city’s strategic location, and the flurry of nightly activity that keeps its defenders occupied has made the capital a hotbed for smuggling. The trade of illegal goods is a constant problem in Sanbaoshi, fueled by bengoshi using the illicit devices for all manner of immoral aims and technologists looking to make a profit by outfitting adventurers with cutting-edge augmetics. It doesn’t help that some of the largest concentrations of Ceramian and Ropaeo communities still in Soburin can be found in the Imperial Capital. These gaijin are by and large unwanted (spurned for continuing on the destructive paths of their foreign ancestors) but as long as they serve a purpose to the clans’ functionaries, they are sure to remain a thorn in the side of the Imperial Guard. Seishin Nohantā: With technology from before the rise of Emperor Hitoshi common all over the metropolis, tsukumogami—items that animate into creatures, usually of the violent sort—are a frequent problem. To combat and respond to the threat an elite team of tsukumogami hunters are utterly dedicated to Sanbaoshi and prowl its streets, protecting the citizens from magical harm. The Seishin Nohantā are a common watchful presence and although they are honor sworn not to directly interfere with the mundane troubles of ne’er-do-wells and criminals in the city, they often act as sentries on behalf of the Imperial Guard, reporting on anyone suspicious that falls under their watchful gaze. Most of Soburin’s lords resisted the Kengen Occupation in all its forms, but a few embraced scientific knowledge and have worked to improve upon it. The Supai were one such clan; when the foreign invaders finally fell half a century ago, Lord Shachō Supai brought together the greatest diviners of the land to see what the future had in store for her prefecture. Though the enormity and totality of the danger represented by the Mists of Akuma remained shrouded to them, how it would descend onto Soburin was as clear as day. Seizing on the technological advances of Ceramian and Ropaeo immigrants, Lord Shachō instituted laboratories and schools to educate her kin on the secrets of science—to great effect. Though she died half a decade ago (some say to a shinobi’s blade) the wisdom of Shachō’s judgment holds true and today the seat of the prefecture’s power is protected by vast, powerful turbines that turn the Mists of Akuma back whenever it descends on the city. The ranks of the Supai clan are commonly fitted with fan hand augmetics for when the fell fog catches them outside of Chikan’s walls, making them a deadly and swift asset on the battlefield, able to charge at ranged enemy lines without fear. With such a prevalence for technology and the dangers of tsukumogami omnipresent, Chikan has adopted a throwaway culture when it comes to personal effects. Hunters that specialize in detecting and tracking the strange creatures are a frequent sight, though only those in dire need or of malevolent intent can stand to tolerate the distasteful behavior prevalent throughout the settlement. They are never in short supply however—even during the destruction festivals—as with every month that passes more and more villages and cities throughout Soburin have come to adopt the wind machines manufactured in Chikan, making it a frequent harbor for legitimate traders and smugglers alike. The Ikari are one of Soburin’s most violent clans, made all the deadlier by taming the majority of the continent’s jungles within their prefecture. Their warriors are masters of the lethal kusarigama, a lengthy chain-sickle that helps them traverse the claustrophobic wilderness with almost as much ease as the enjin that live there—ape-like people that the Kengen Occupation disastrously attempted to force into submission within Ikari cities. The clan’s longtime tradition of martial study put them in a good place to handle the insurrection that followed, and though Nesuto to the north housed more of the simian wildmen, Nagabuki’s size made it the ideal place for keeping the most rebellious enjin afterward, turning the settlement and its residents as hard as the bark of a tapok tree. Ceramian soldiers may be a thing of the past but the marks of their imposed rule are still fresh all over Nagabuki. Already militant since before the Ichizoku Wars began, the Ikari were one of the last clans to relent to the Kengen Occupation and as punishment for their resilience the foreign invaders chose the most troublesome race to make the martial clan coexist with. The Gem of the South changed to match the the city’s needs during the times of imprisonment (as they are known to the enjin), changing much of its historical layout to be far more like a fortress than that of a bustling settlement—tall walls surround Nagabuki, always at a greater heighter than any nearby buildings and a sizable distance from the tallest structures. Way of the Tattooed Pagoda: The inspiring jungles of the Ikari Prefecture drew out the mysticism of the clan’s few mages and priests, and long before the Ichizoku Wars’ end enchanted tattoos had already become culturally tied to Nagabuki. Artwork inscribed onto skin—both magical and otherwise—is a common sight among warriors, used to mark their rank or as a way to commemorate their deeds. Soburin’s most famous arcane artists specializing in crafting mystical illustrations on the body are found here, and combatants looking for a traditional way to amplify their prowess travel to the Gem of the South in search of its magical tattooists.